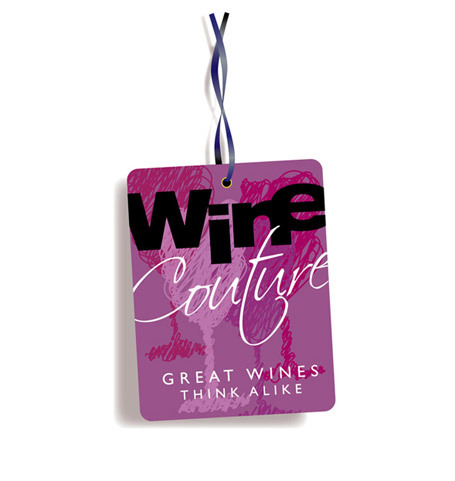 Upmarket women's wine networking club, with events and online membership. To create a completely new brand identity for a range of material and website, to raise their profile and awareness and build membership of a fun club. We designed concepts that looked at the female and couture elements of the brand in order to combine a business like structure with a feminine edge. Looking back to the designs of Grauer and other fashion illustrators we finally hit on the idea of a swing tag. Using a soft purple palette with dynamic and pastel style illustrations of wine glasses to suggest sociability and the actual act of drinking, we matched this with a bold but fun font to give a more corporate feel. A flourish of strapline completes the identity adding flair and personality to the brand to create a fashion statement that makes members want to be part of something dynamic. Striking contrasting colours on the website give a fresh and lively feel. Increased confidence and bold material for their launch event, which was great success.